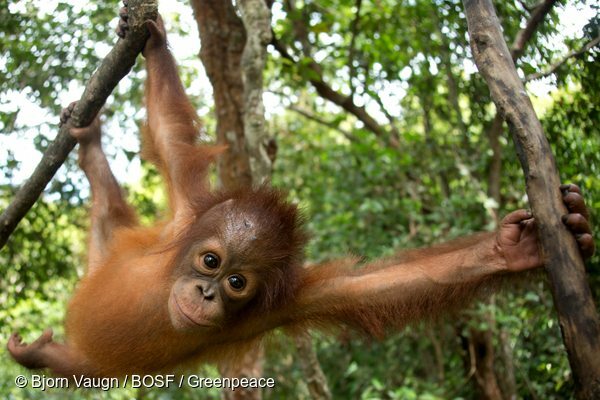 There's been a major development in our campaign to protect Indonesia's forests. IOI, one of the largest palm oil traders in the world, has just made a significant commitment to protect rainforests. If put into practice, this would address the problems on the company's own plantations and set new standards for the whole industry. This fantastic result comes after many years of campaigning by Greenpeace supporters, who persuaded big brands to stop buying palm oil from IOI until it showed it was serious about safeguarding forests. Pressure from people around the world was instrumental in pushing IOI towards these new commitments that go well beyond what other traders have agreed to. All eyes are now on them to follow IOI’s lead. IOI has not yet addressed the environmental and social impacts of its palm oil, but it has published an action plan and agreed to independent third-party verification of its progress in one year’s time. Greenpeace expects IOI to follow through on these commitments and will be watching it closely. IOI is the third-largest palm oil trader in the world, buying and selling from hundreds of other companies. 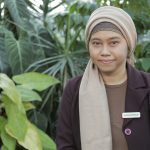 It has its own landbanks in Indonesia and Malaysia where it had been replacing forests with plantations and coming into conflict with local communities. Since 2008, we have been exposing how IOI has been linked to the destruction of valuable forest and peatland areas, exploitation of plantation workers including reports of child labor, and extensive fires on its land contributing to the thick pollution that often swathes large parts of Southeast Asia. And because IOI buys so much palm oil from hundreds of other growers and traders, it was linked to environmental and social problems happening on land controlled by those companies. Over the years, IOI has produced a string of commitments about ending the destruction, but none of them were properly implemented and failed to make a difference on the ground. 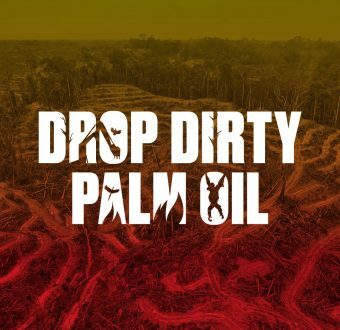 Then in March 2016, IOI was suspended by the Roundtable on Sustainable Palm Oil (RSPO) following a complaint by environmental organization Aidenvironment, which meant it could no longer call any of its palm oil ‘sustainable’. IOI even sued the RSPO about the suspension, although later dropped the case. Many of its major customers, such as Unilever and Nestlé, stopped buying from IOI and refused to go back even when the RSPO suspension was lifted a few months later. Some companies needed more persuading – General Mills, makers of Betty Crocker cake mixes, were happy to continue trading with IOI until thousands of Greenpeace supporters emailed the CEO to point out how irresponsible this was. 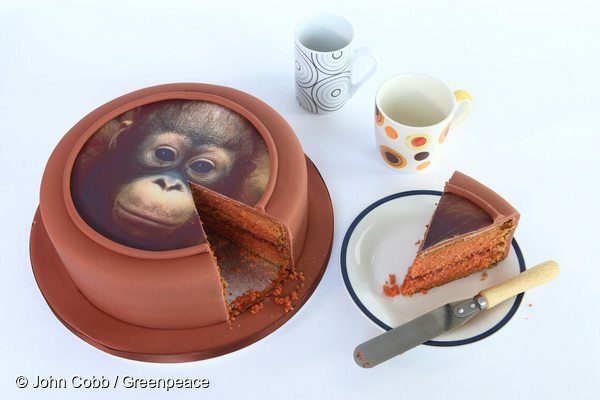 Activists in the UK made this cake image with a threatened orangutan on it to pressure Betty Crocker. 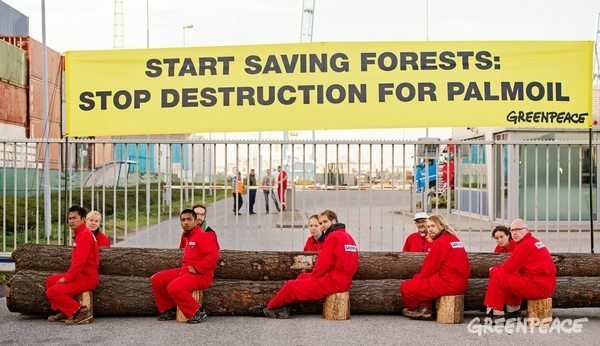 When activists blockaded IOI’s refinery in Rotterdam, it was to remind the big brand companies that it was still a palm oil provider they should avoid. And delivering 300,000 signatures from around the world to their head offices in Kuala Lumpur took the campaign right to the company’s front door. IOI Palm Oil Company Blockade in Rotterdam Harbour, in September 2016. A group of Greenpeace volunteers and representatives from several Malaysian environmental groups attempted to deliver a petition with 300,000 names from Greenpeace supporters around the world. The petition asked IOI to stop forest destruction and stop the Southeast Asian Haze. The company refused to accept the petition, in September 2016. 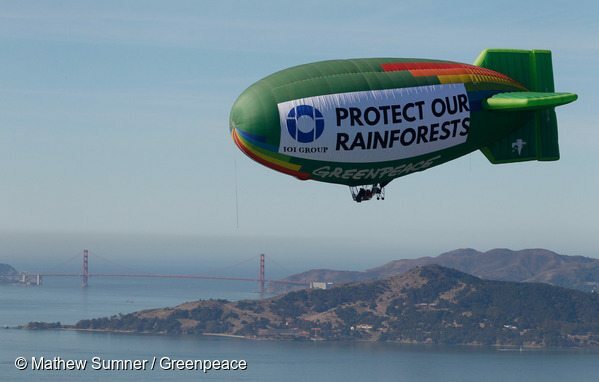 The Greenpeace thermal airship A.E. Bates flies over the San Francisco Bay area near a facility where palm oil trader IOI imports its palm oil in the San Francisco Bay area, in October 2016. Losing such big customers put IOI under enormous pressure and was instrumental in bringing about this change in direction. But if so many previous commitments have not been fulfilled, why should this time be any different? Today’s announcement goes much further than anything IOI has promised before. It has said it will commission independent verification of how well forests and the rights of workers and communities are being protected on its own land. IOI has also committed to resolve long-standing conflicts with local communities and respect the rights of plantation workers. One of the most important points is that IOI will be actively monitoring its suppliers to ensure they too are safeguarding forests and people. 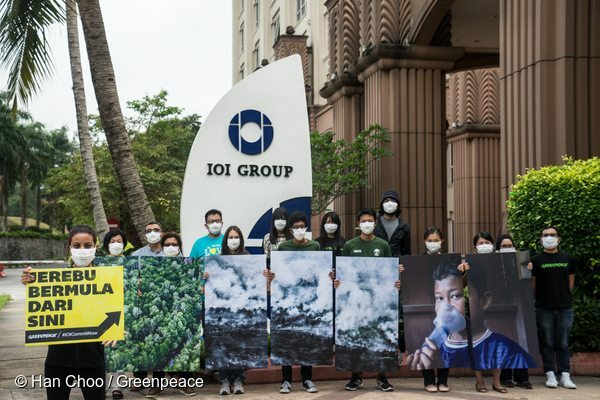 Any company selling palm oil to IOI will need to prove it is protecting forests, so the impacts should spread far beyond IOI’s own operations. The big prize here is that IOI will be able to put pressure on the other big palm oil traders – Wilmar, Musim Mas, Golden Agri Resources and others – to step up their efforts. The traders sell palm oil to each other and other traders will need to interrogate their own suppliers to ensure IOI does not receive dirty palm oil. Deforestation is still a huge problem for the palm oil industry and the traders need to act immediately to eliminate deforestation from their supply chains. They need to publish their own rigorous plans showing how they will screen their suppliers and cut off those that are continuing to destroy forests. The proof, as always, is in how well these promises are put into practice. There is still a lot of work to do before IOI is completely free from deforestation. We will be monitoring progress closely and won’t hesitate to challenge IOI if we think it’s not keeping its word. Right now, enormous thanks must go to everyone around the world who helped achieve this important breakthrough and brought an end to deforestation in Indonesia that little bit closer.